Kevin Sneed, PharmD, is the founding dean of the University of South Florida College of Pharmacy and a tenured associate professor in the USF Department of Family Medicine. He joined the USF Department of Family Medicine in 1999 as a visiting professor from Florida A&M College of Pharmacy, where he was an associate professor and ambulatory care clinical coordinator. At Florida A&M, he was a key member of curriculum committees and participated in several accreditation reviews – experience that has helped in building USF's PharmD program to comply with new accreditation standards. In addition to teaching pharmacy, medical and other health-professions students and conducting funded clinical research, Dr. Sneed created the USF College of Medicine's first primary care clinical pharmacy program. More recently, he developed consultant pharmacy services for the Morsani Center for Advanced Healthcare, a USF Hemophilia Center Pharmacy, and a USF Clinical Research Pharmacy. Dr. Sneed's primary clinical and research interest is cardio-metabolic disorders. He has published numerous peer-reviewed papers and a book chapter. He established USF Health as a member of the National Pharmacy-Based Research Network, which will serve as the foundation for future USF pharmacy faculty to conduct national-level studies with other pharmacy programs across the country. Dr. Sneed has a long history of community service to underserved communities. He created and directed the Inter-collaborative Student and Community Health Assessment Project and Evaluation (IN-SCHAPE), a nationally-recognized cardiovascular health disparities project that addresses cardiovascular risk factors in Hillsborough County communities. He has received statewide recognition from the Florida Prostate Cancer Network for his efforts to educate African-American men about cardiovascular risks. Dr. Sneed received his PharmD degree from Xavier University of Louisiana College of Pharmacy in 1998 and completed a primary care pharmacy residency at Bay Pines VA Medical Center in St. Petersburg. 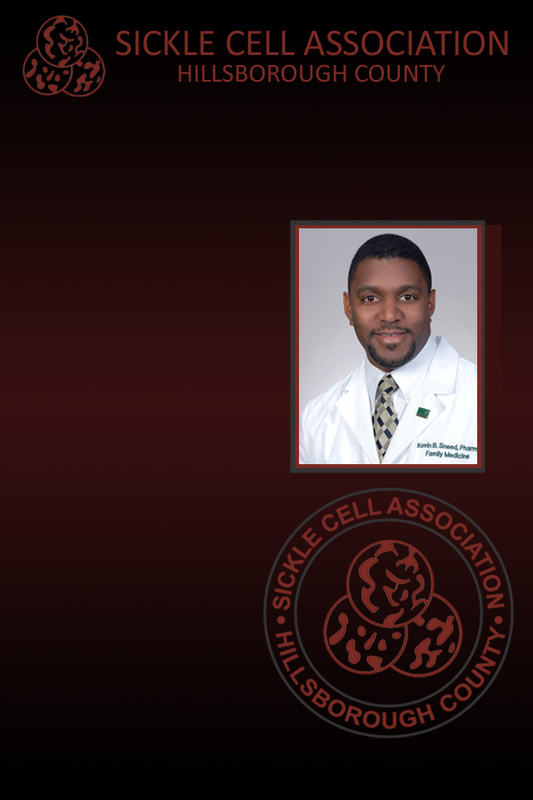 The Sickle Cell Association of Hillsborough County was established in 1976. For over 35 years, it has provided materials to educate persons with sickle cell concerning medical, sociological, and psychological implications of sickle cell disease and trait. Counseling is provided to individuals and families diagnosed through the Newborn Screening Program. Educational programs are conducted to community groups, health care providers, and public and private schools. The organization also provides medical and social services referrals to individuals and families affected by disease. SavvyCard is an online business card that makes working with Kevin as easy as tapping a button! Tap the Email button to contact Kevin directly. Tap the Share button to share Kevin's SavvyCard with anyone you think might be interested.